Here’s something we don’t get very often at RustyButTrusty – a car that has participated in the same event as one of our fleet. Of course, for the Concours d’LeMons, the Corvair is no less obvious a choice than an Alfetta, and both show up in the Car & Driver coverage of the 2012 show. 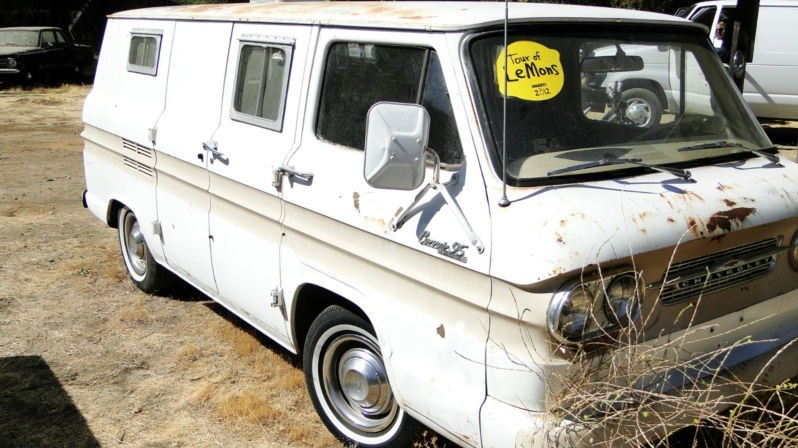 In any case, the van versions of the Corvair usually come in two flavors – totally sun-baked projects out in someone’s field, or lovingly restored models in the same price range as some VW microbuses. 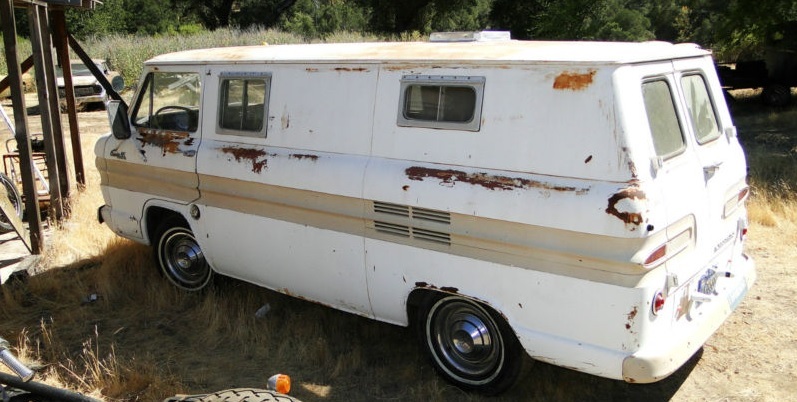 Not so for this Corvair 95 van, which is offered for a Buy-it-Now price of $2595 in Greenfield, CA. In spite of the “I Heart Vermont” bumper sticker on this van, it’s been in California since at least the 1980s, if not earlier. Perhaps the sticker is from Clark’s Corvairs (based in Vermont)? Below you can see the evidence of the van’s participation in the 2012 Tour d’LeMons, so you know it was capable of the 1-hour drive from Greenfield to Seaside and back. Not only is the car already semi-famous on the internet, but it’s moving along to television fame. 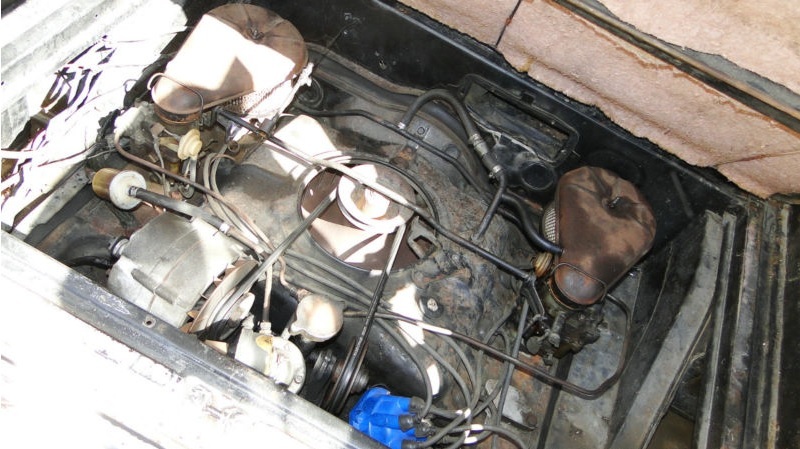 The seller lets you in on a little secret by divulging that the car is being sold as part of a factual entertainment show for a major US network. The stereotype of Corvair drivers would suggest it’s an episode of “Hoarders”, but we’re hoping for something less obvious like one of the many automotive or picking programs that’s been showing up on TV lately. 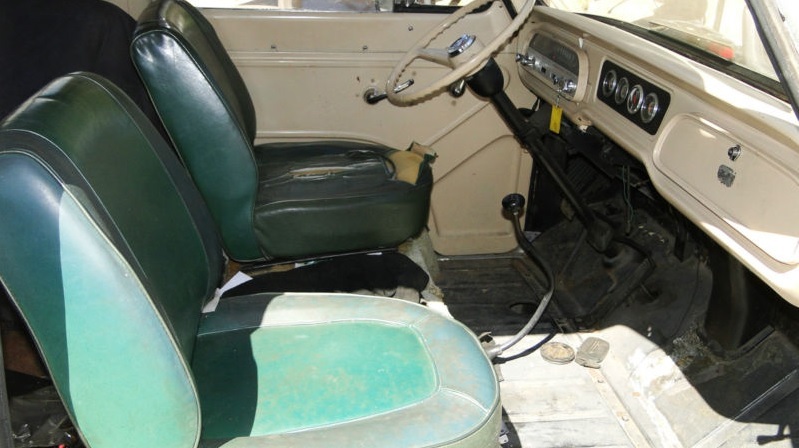 The interior of this van looks pretty decent – you’d want to redo the driver’s seat, but other than that it looks quite respectable. What would you do with the rest of the interior, since it’s already got those funky little side windows? Hooray for the manual transmission – or is a 4-speed paired with a flat-6 engine less fun than it sounds in a van? Forget stuffing a Porsche engine in your microbus, Chevrolet’s already done the hard work for you! Engine is not too scary either. Given there’s a good chance this thing runs, and its semi-famous status, you’d be a fool to walk away from this one! This entry was posted on September 12, 2013 at 5:00 am and is filed under Feature. You can follow any responses to this entry through the RSS 2.0 feed. You can leave a response, or trackback from your own site.